Anchorage resident Isaac Vanderburg realized in late 2017 that he was having the same conversation with a lot of his neighbors in the Airport Heights area. Vanderburg reached out to organizations that work with renewables like the Alaska Center for Energy and Power, or ACEP. The first phase of the Solarize Anchorage campaign was born. The program brings together community members to purchase solar panels in bulk. That saves money for the company that installs the panels and results in a discount for residents. The campaign hosted community events and did door-to-door outreach in Airport Heights. Thirty-two residents signed on, three times more than organizers expected. 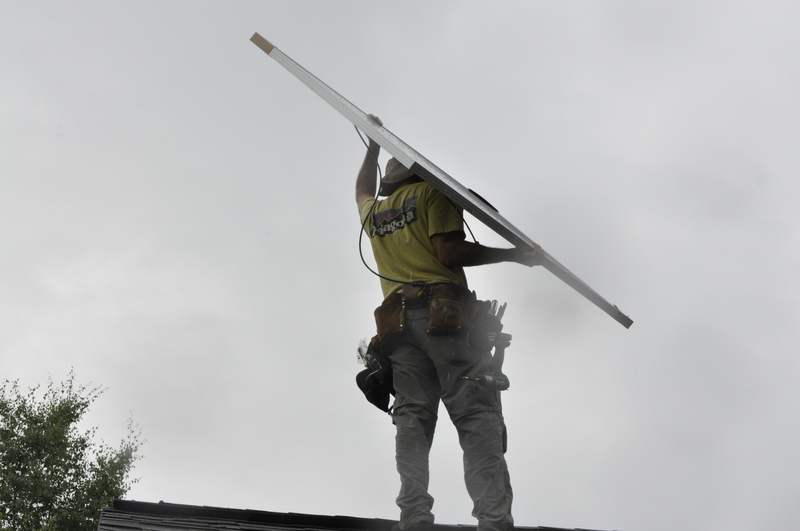 It’s starting to rain as Anchorage Solar employee Tim Remick hoists a solar panel over his head and slides it toward the pitch of a garage roof. Another member of the team sets it atop two metal bars at the roof’s edge and clamps it into place. They spent the better part of yesterday and this morning preparing for this moment, putting in wiring and taking care to protect the integrity of the roof. Not to mention the permits, inspections and the planning and design behind each installation. They’re about halfway done with all their Solarize Anchorage installs. And Remick said people are starting to take notice. “We’ve had kids feel like we’re the ice cream truck. We drive by and the kid’s like ‘Solar so cool! Dad, can we have some?’” Remick said. They’re installing for home owner Lisa Pekar who said part of why she wanted to participate in the project was to teach her son about renewable energy. When the team’s finished, the south-facing half of the roof is covered in panels, enough that Pekar hopes to sell some of the power back to the grid in the summer months. She’d never considered solar before signing on to the project. The U.S. is set to reach 2 million solar panel installations by the end of this year. It took 30 years to reach the first million and just two to add a million more. Solar panels have gotten a lot cheaper and more efficient in the last few years. 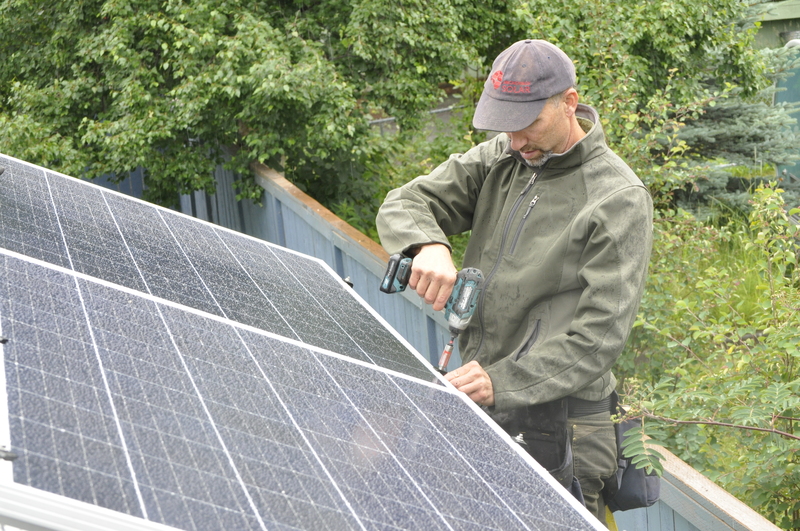 Anchorage Solar owner Ben May, who won the contract for the project, said solar’s increasing affordability boils down to policy. Germany started a feed-in tariff program, an incentive that pays people for producing clean energy like solar. Alaska is playing catch-up to the national solar trend, May said. His business has boomed, increasing almost eight-fold since they opened in 2016. One hurdle is reaching people who’ve thought about solar in the past but found it too expensive. Panel cost has dropped to almost a tenth of what it was ten years ago. Then there’s Alaska’s dark winters. Depending on the number of panels and their energy usage, homeowners can produce enough in the summer to cover their winter power costs and then some. Still, the price tag isn’t small. An average install costs $10,000. Solarize Anchorage saved participants about 10 percent. Federal tax credits and state and local incentives help bring down the expense. It takes about 10 years to pay back the up-front costs. Alaska Center is in charge of education and outreach for the project. Kristen Collins says the program was modeled after similar ones across the country but is the first of its kind in Alaska. They’re not sure yet what the next phase of the project will hold, but they’ve already started brainstorming. Ideas include adding commercial buildings and expanding the program to other forms of energy.